Dan Rizzie's paintings, prints, and collages - many inspired by his years in India - hang in museums and private collections across the U.S. See some recent works. voused in Paris in December 2006. Read more from Joanne. Perrellis in Vermont. Al Perrelli, second from right, was AIS Superintendent in the late 1960s and early 1970s. Ted Beck and Anne Briggs Beck, both Class of 1969, visited the Perrellis at their home in Vermont in August and made this portrait. From Left to right are Nate (Tena's son), Tena, Class of 1971, Al Perrelli, and Dorothy Perrelli. Grace Jarrett, Class of 1989, with her husband Will on their honeymoon in Hawaii, August 2006. Read more from Grace. Mia Lefkowitz Inderbitzin, Class of 1983, with her husband, Kurt, in Mumbai. Read more from Mia. 74 ENCORE!!!! Alumni gather for a Ride the Ducks tour of Philadelphia during their class reunion in July 2007. Enjoy their weekend report, along with some letters and photos and see who was there. Childhood Friends Reunited. Becky Orchard, fourth from left in "pink" dress, and Beverly McElroy Coville center right in "blue" dress, were good friends when this birthday party picture was taken in Djakarta in 1962. When their diplomat parents moved on, they lost track of each other -- until now, thanks to AIS/AES Alumni Network. Becky attended AIS in 1968; Beverly came to our school several years later and graduated with the Class of 1973. They sent us this photo of an old friendship now renewed. Clockwise from upper left: Cindy Jones Ondrak, Ellen Turner, and Judy Newberry Ashley, all Class of 1969, in Montana, August 2007; Cowgirl Ellen; rodeo; Cindy's home near Missoula. Bruce Rogers in Afghanistan, with the Governor of Bamiyan Province, August 2007. Read more from Bruce. The AES high school building was demolished in summer 2007 to make room for a new facility. Read more from Brian Campbell, Class of 1977. Carol Rizzie York, Class of 1971, with her brother Dan Rizzie, Class of 1969. Read more from Carol. Raquel with her children Eva and Sam, May 2007. Read more from Raquel. Robin Murphy, Class of 1970, writes, "We stopped at a small gas station this weekend in rural Virginia (taking one daughter to camp, picking the other one up), and I saw this license plate. Cracked me up......"
Peter Johnson, Class of 1978, and his wife, Nancy, atop the York Minster cathedral, November 2007. Read more from Peter. Paige Grant, Class of 1969, with her husband Neal Williams in Hong Kong, November 2007. Photo by Taka Yamanouchi, Class of 1970. Jerrye Tate Gilmore, Class of 1965, with her husband, Steve, in Jamaica, April 2007. Read more from Jerrye. Tim Moore, Class of 1970, and his wife, Cathy, visted Vivien Rubel Fuller, Class of 1968, in June 2007. Tim writes, "I am currently in Cairo with my wife Cathy (She is the Chief of Contracting for USAID here). I am retired from the Air Force and am playing house husband for now. We spent the last two years in Iraq (me with State and Cathy with USAID)." Joe Bettinger, Class of 1966, with his family in their newly restored home in Tuscon, Arizona. Read more from Joe. Doug Davy, Class of 1967, with his wife on a boat tour of San Francisco Bay. Read more from Doug. The Campbells in Jaipur, May 2007. From left to right are Brian Campbell (green shirt) Class of 1977; Loree Campbell (Brian's wife), AES-HS PSA (Parent Student Association) Rep 2006-2008; Brian and Loree's daughters Alex, Class of 2008 and Kate, Class of 2011; Matt Campbell (Brian's brother), born in Delhi returning after 37 years. Members of the Campbell clan have been attending AIS/AES since the early 1960s. Cindy Shaw, Class of 1967, with her sons Ben and Shaw, in Washington, DC, October 2006. Read more from Cindy. Tim Brown, Class of 1970, with his family at the Tidal Basin cherry blossoms in Washington, DC, April 2007. Greg McCaffrey and his wife, Diana. Read more from Greg. 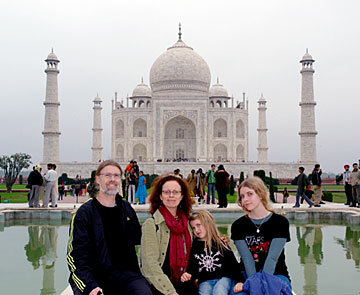 Phoebe Bradley, Class of 1974, with her family at the Taj Mahal, February 2007. Read more, and see more pictures, from Phoebe. Sameer Verma and family, during a recent visit to Vancouver, BC. Read more from Sameer. AIS/AES alumni in Tokyo, March 2007. From left to right are Chikako Tsuruta ('72), Haruko Tsuruta Morimoto ('74), Seiichi Sugiyama ('74), twins sisters Beryl Hawkins ('69) and Sheryl Hawkins Bridgewater ('69). Robert Scriban and family at home in Toronto. Read more from Robert. Deepak Sen and Phoebe Bradley in New Delhi, February 2007. KC Gray Siebert, Class of 1970, and her husband, Neal, celebrated their 25th wedding anniversary on board the Paul Gauguin, near the Marquesas and Society islands in the South Pacific, January 2007. Veronica Choi Krath and family. Read more from Veronica. Veronica Choi Krath with her husband, Mike. Read more from Veronica. Cherie and David Lazaroff celebrated their 40th wedding anniversary in Hawaii in 2006. Read more from Cherie. Ritu Mehta in 2006. Read more. Robin Murphy visited AES in 2007. Peter Carruthers (left) and Glenn Ord, Yarra Valley, Australia, January 2007. Class of 1974 alums Harlan Wood, Vineet Bhatia, and Deepak Sen in New Delhi, January 2007. California New Year's Eve, 2006: Standing: Bill Stollberg ('70), Judy Newberry ('69), Dean Newberry ('66); seated: Paul Reiger ('70) and Jim Newberry ('70). Howard Auble, Class of 1962, with his wife, Katie, at their home in Raymond, Washington. See the Class of 1962 graduation photo, and more from the school's early days. Monique Esselmont, Class of 1987, with husband Jerry, son Ethan, and new arrival Sarah Mae. Read more from Monique. Fran�ois GALAS, Class of 1984, at top, with his wife and three sons. "Visibly, we did not get the recipe to do girls..." Read more from François. Alumni gathered for a memorial concert August 12, 2006 to honor Elizabeth Ronkin, mother to George and Maggie Ronkin. From left are Jane Freundel Levey, Maggie Ronkin, both Class of 1971, David Ide, and George Ronkin, both Class of 1969. Carol Rizzie York, left, and Cookie Kinkead, were childhood swimmates and met again by chance while on holiday in Jamaica. Read more from Carol. Phoebe Bradley in her studio, 2006. Visit her personal website for selected works. Read more from Phoebe. Phoebe Bradley's husband Sheldon and daughters Thea and Chloe in London, Spring 2006. Read more from Phoebe. The Bushnell Family - Dad, Mom, Bob, Lynette, and Sheila Bushnell. Read more from Meg Murphy. Tim Brown, Class of 1970, with his son Archie, at a Washington Nationals baseball game, July 2006. Mary (Flanagan) Williamson with her husband, Chief Master Sergeant David Williamson, on their wedding day, May 10, 2006. Marriage Announcement by email. Barbara McCabe, left, Alan Egler and Mary Flanagan Williamson attended AIS in Calcutta and New Delhi. Read more from Mary Flanagan Williamson. Ritu Mehta at the Taj Mahal, May 2006. Read more from Ritu. Sid Wahid at the Great Wall of China, 2004. Read more from Sid.